A decade after the fight of San Francisco, Ceasar and his following of intelligent apes have adapted to life in the Redwoods. Suffering the consequences of developing the drug which created these apes are the humans who have spent the last 10 years surviving a Simian Flu epidemic.The apes are convinced that the humans have lost their battle against the disease, until a member of Malcolm’s (Jason Clarke) group runs into two apes and shoots one in excitement. Ceasar still faithful to his no killing rule lets the humans escape, unaware that they are searching for a power source to get San Francisco running again. 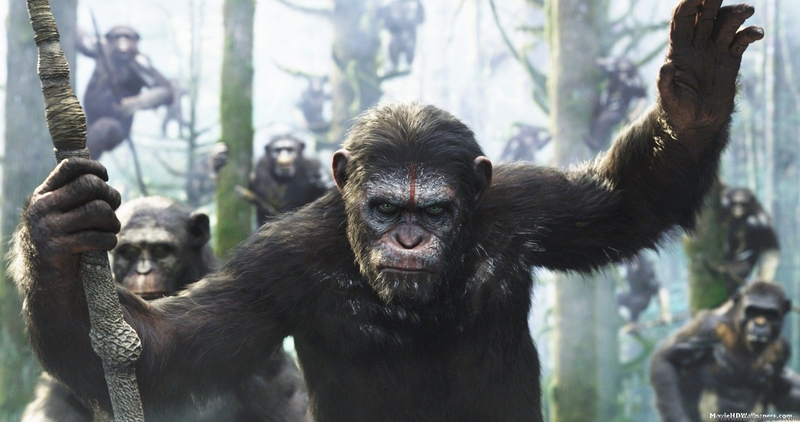 Dawn of the Planet of the Apes joins the ranks of great sci-fi blockbusters this year among the likes of X-Men: Days of Future Past, Edge of Tomorrow and Godzilla. Films which could really prompt the rise of genuinely good sci-fi films. For a sequel Dawn of the Planet of the Apes completely trumps its predecessor in all departments. Keeping Ceasar central to the story was a masterful decision and because of it we get a far more compelling story than that of the humans. We’re ultimately trying to get our way to the climax which is the planet of the apes, and it wouldn’t have felt right if Franco was still there fighting for screen time. Of course he is a massive part of Ceasar’s origin story which is where Ceasar’s compassion and empathy for the humans comes from, also a reason why Rise of the Planet of the Apes works so well, but telling the majority of the story from Ceasar’s perspective was definitely the right way to go. This way we have a protagonist who is unbiased and has an impartial view towards the world, a character we know we can trust in a broken society. During Rise of the Planet of the Apes, we see Ceasar grow up among humans, absent to life with his own kind outdoors where he belongs. He doesn’t know what humans are capable of or where he came from, but asking the questions gives him answers he finds hard to swallow. Ten years on he and his family of intelligent apes have formed a sophisticated society living as one. Dawn of the Planet of the Apes is great in so many ways, it could have easily turned into a cheap action crapfest but instead it’s an intelligent film not short of the human element. I think I join a large group of people who were attracted to this film purely because of apes with guns on horses, I mean I’ve never heard of anything as awesome as that. Anyone expecting 2 hours of apes with guns may be disappointed but I’d like to think that they’d be pleasantly surprised at the same time. We spend most of the film with Ceasar amongst his family contemplating how to deal with the humans. We learn their way of life and how they all live as one and care for each other, living without the modern necessities that we live with nowadays such as electricity and internet. It makes us question how we are as a modern society, everything that is wrong with it and everything right with it. Ceasar genuinely believes that Apes are better, but as the film unfolds he learns that ignorance and indifference is something you can’t prevent and maybe conflict is all but inevitable within nature. This film not only shows us the potential of sci-fi but also how far performance capture has come. Andy Serkis has revolutionized the film making tool and proves that it shouldn’t be ruled out as a legitimate method of performance. A lot of buzz has gone around saying that Serkis deserves an Oscar nod after this performance, and I’ll have to agree. It’s amazing to even think that a man is literally playing Ceasar, all of his facial expressions, his movements, all these details which bring the character to life. Serkis expresses so many emotions just from these delicate details which is pretty amazing since Ceasar’s dialogue is quite limited. I’ve never felt such a strong connection with a non-human protagonist. That being said, Serkis is only one of many who use performance capture to play the ape characters. The likes of Toby Kebbell and Judy Greer prove that Serkis is not the only actor who can master performance capture. Kebbell especially puts in an absolutely terrifying performance as Koba, an ape who can’t forgive the years of torture ensued by the humans. The only negative about the film would probably be the human characters, the only character which stands out is Malcolm (Jason Clarke), one of the few humans who see the apes in a much brighter light. He is to an extent quite an important character as he reminds Ceasar that not all humans are corrupt. Characters like Dreyfus (Gary Oldman) and Carver (Kirk Acevedo) represent how we find it hard to blame ourselves for the downfall of humans, even when the facts are right in our face. To an extent they mirror Koba’s same feeling of indifference. As for the aesthetics, the CGI is a lot better than its predecessor by a large margin. The apes actually look real this time around, improving from the choppy CGI we had in the first film. The set design is incredible creating a post apocalyptic forest look to both San Francisco and the Redwoods, which sets up some incredible shots throughout the film. It’s just an overall great looking film. Also props to the sound mixing crew who created a genuine ape society atmosphere, sitting in the cinema and being able to hear apes surrounding you was not only awesome but put in perspective how many of them there were. Dawn of the Planet of the Apes is definitely one of the best films of the year so far, not for its spectacle but more for its storytelling and direction. We’re being given an intelligent story about war and human nature, a film which makes us think rather than fry our brains, and for anyone who wants their brains fried, well apes on horses with guns! Having gone through a stint of directing rather large budget films, Jon Favreau has “gone back to basics” with Chef, a film about cooking as a passion and a way of life. Carl Casper (Jon Favreau) is a passionate chef running his own kitchen at a stable restaurant, yet he is unhappy. Restaurateur Riva (Dustin Hoffman) wants him to play it safe but after countless years of serving the same food, all Casper wants is freedom so that he can go back to enjoying his passion once again. Chef is one of those films that has you smiling throughout its run time, not purely from its humor but from its down to earth charm and feel good vibe. Everyone has a passion, it may dominate our lives or it may just be a hobby but we all have one. Seeing Carl Casper living his passion and being it is not only a joy to watch but inspiring for all us dreamers out there. Chef is a film that tells us that the measure of success is not large sums of money or working in a respected establishment, but the currency of happiness. Casper may have been blind to his unhappiness for years but once his creativity is obstructed he realizes that freedom is all he needs to be happy again, and just like Jon Favreau, going back to basics is the way to go. What I love about chef is the detail that’s gone into depicting cooking and food as a passion, all the intricate details from handling the food to the acting. I totally bought into Jon Favreau’s character because he totally embodies this person who lives for food and all he wants to do is share his passion with others so that they can experience everything he loves about his art, and isnt that what all artists strive to do. But just like any art, it can be corrupted by external forces be it the industries or people that want to take control and that’s when problems occur. Ultimately the direction is brilliant, Chef is a film that knows what it wants to be, a grounded, character driven piece of film with a great soundtrack. My favorite moments in the film are equally the same moments I hate because it makes me so damn hungry!. Seeing Casper handling his food as if each ingredient was his own child, so delicate and perfectly handled just hits home how much he loves what he does. It makes those father-son montages later on in the film that much more pleasing and effective, as we get to see Casper share his passion with his son. A relatable theme for me especially, bringing me back to the days where being told to do all the crappy chores from my dad was called bonding. As for performances, props to Emjay Anthony playing Casper’s son, who gives for me the best performance in the film. He’s just a kid stuck in between his parents divorce who doesn’t quite understand it but at the end of the day he just wants to hang out with his dad. He’s innocent but optimistic, never intending to be overly emotional about the situation, just making the most of his time with his dad. As a result of his performance, the father son relationship steals the show. It may not be the most eventful road trip film but it sure is the tastiest, offering an upbeat playlist of latin jazz and flavor, a film that will make you want to go out and partake in your passion.